This week’s challenge will have you thinking larger than life! In celebration of Roostery’s bedding launch, we’re challenging you to create a large scale fragmentation design that would be the perfect addition to your bedroom decor. From deconstructed pops of color to fragments of dispersed light, bring your artwork to life but remember to think big! Entries will be previewed at the yard size: 42″ x 36”. Submissions close November 7 at 3 p.m. Eastern Time. Voting begins November 9. See official rules. This is my entry for this week. 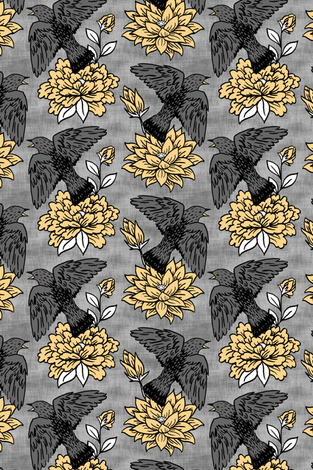 The design basically covers a yard of fabric and the neat fragmented starburst goes almost to the edge of the design. 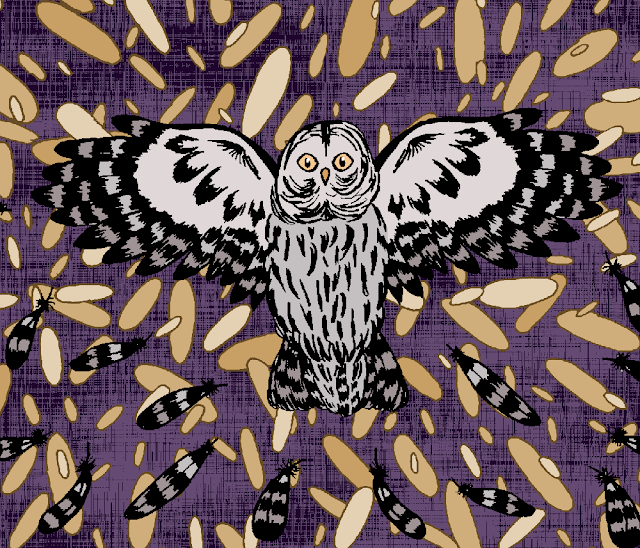 I decided to use a barred owl as my centerpiece, and the patterning is a bit simplified but mostly accurate. The eyes should be completely black in this type of owl, but I think it looks a little less scary with the big yellow irises. This week, we’re challenging you to create a design inspired a favorite childhood activity: coloring books! We’ve partnered with Lake, an interactive coloring app. The winners will be included in a special black and white Spoonflower coloring pack in the Lake coloring app. Create a design in black (#000000) on a white (#ffffff) background. 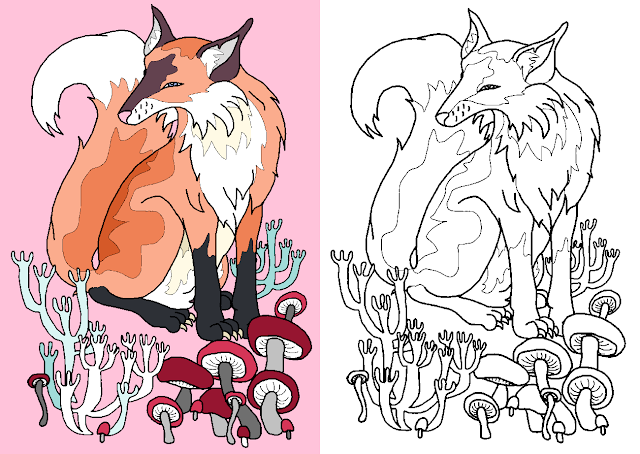 So this week I went for a fun fox and mushroom design. It has lots of little elements to color, and I can confirm that it's fun as I have done several different color versions like the one at the top. So this design started out in my sketchbook. You can really tell I wasn't sure about how to divide the color areas. So I retraced the design and modified it a little, and then I taped the tracing paper to a piece of paper and scanned them both in. Do you spend your weekends venturing to local botanical gardens, dreaming of the next oversized houseplant to make its way into your home? This week’s challenge will be the cure to your leafy green obsession. While you are not required to block print for this challenge, your entry should be inspired by the block printing technique. This is my entry for this week's contest. The botanical block print that I did was just from computer edited sketches. I did think of going all the way and making a real block printing. In the end it seemed like a week just wouldn't be enough time to learn how to do the carving, purchase all the supplies, and be able to make a good quality printing. Family traditions are especially present during the holidays as everyone gathers in merriment and celebration around the dinner table. For this week’s challenge, share a family recipe that is a yearly staple. Whether it’s Grandma’s famous casserole or the wiggly fruit jelly salad that mysteriously makes an appearance, we want to see what recipe completes your holiday traditions! Entries will be submitted at the Linen Cotton Canvas fat quarter size (27″ x 18”) but previewed during voting as a Spoonflower Special Edition Tea Towel (16″ x 24″). Submissions close October 3, 2017 at 3 p.m. eastern daylight time. Voting begins October 5, 2017.